The Sanctuary of Truth is a gigantic wooden construction which covers the area of more than two rais. The top point of the building is about 105 meters high. It was constructed to withstand the wind and sunshine on the seashore at Rachvate Cape, Tumbon Naklea, Amphur Banglamung, Chonburi Province. The purposes of decoration with wooden carve sculptures are to use art and culture as the reflection of Ancient Vision of Earth, Ancient Knowledge, and Eastern Philosophy. With in this complex, visitors will understand Ancient Life, Human Responsibility, Basic Thought, Cycle of living, Life Relationship with Universe and Common Goal of Life toward Utopia. Short Description: Sanctuary of Truth is a religious construction in Pattaya, Thailand. 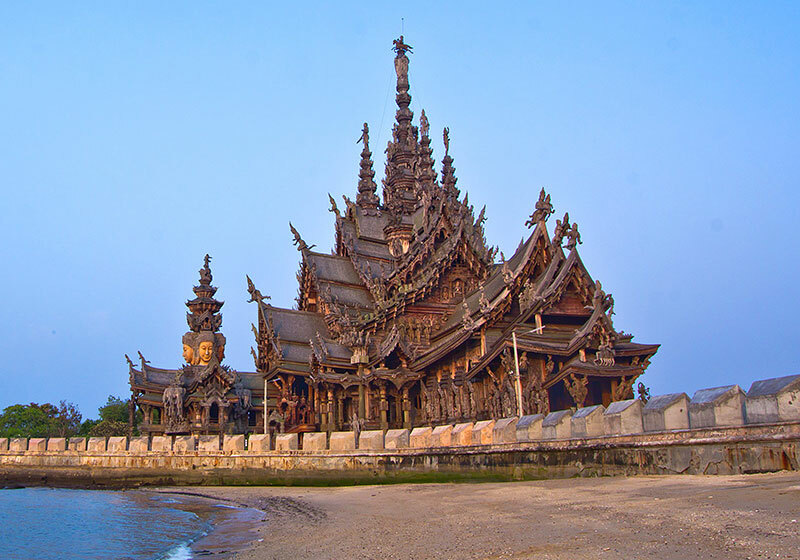 The sanctuary is an all-wood building filled with sculptures based on traditional Buddhist and Hindu motifs.